Prairie Quilts and Kolaches: Go Big Red!! I got this in an email today (Thanks Iris!) and there was no copyright, so I'm going to post it. One of Autumns simple pleasures.... Husker Football on the radio. "Man, Woman and Child!" "Touchdown! Touchdown!! Touchdown!!!" Gee I miss Lyle Bremser & Jim Rose announcing the games. I loved when they got all worked up and excited. ".... one of College Football's greatest in-game quotes ever, "Holy Moly! Man, woman and child did that put 'em in the aisles... Johnny the Jet Rodgers just tore 'em loose from their shoes!" Sorry to all of you who are not Husker Fans... I just felt like sharing all this today. –– "For the better part of 35 years, playing against the Huskers has been like playing with fire in the middle of a hay field: you like your chances at first, but soon enough the fire gains the upper hand. And, sooner than later, fire surround every cutoff route, making you wish you hadn't started playing with fire in the first place. In the world of college football, Nebraska is the fire. "It is nearly impossible to become a great football power unless there is some support from the fans. At Nebraska, support just doesn't seem to be the word to describe what the fans do for the football team.... From the border of Kansas north to South Dakota, and from the Missouri River west past the sand hills to Scottsbluff on the border of Wyoming and Colorado, just about everybody in Nebraska is a Cornhusker fan. And they have staked their claim that they are the best fans in college football. "Even lately, Beano Cook of ESPN stated that one place you will always see sportsmanship is in Lincoln, Nebraska, when Nebraska fans are around. "Yes, it would be difficult not to mention that all of Memorial Stadium's 20 gates have "Through these gates walk the greatest fans in college football" written above them. 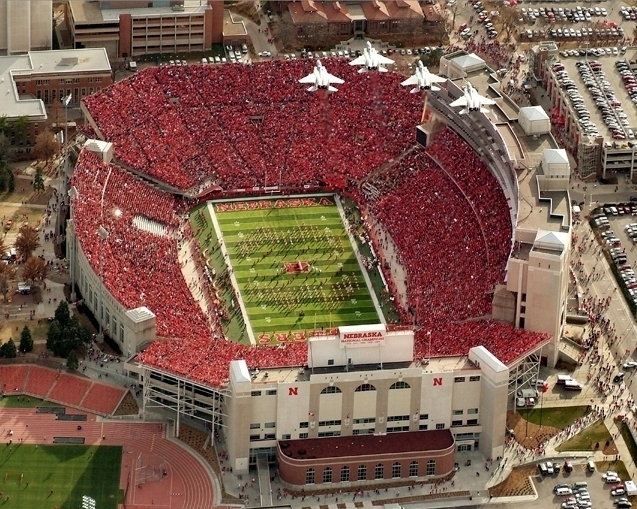 The "Sea of Red" can not be overlooked when flying over Lincoln on game day...."
~~ Nathan Walters, Copyright © 2002-2008 Helium, Inc. All rights reserved. As fellow Nebaskan, loved the post. I'll bring a post over on the kolaches, it's on my "old" blog site.